A mother of four and domestic worker of Sixth Street, Tain Settlement was Tuesday evening, shot at close range, execution-style, during a home invasion by three masked men, one of whom was allegedly armed with a shotgun, while the others carried out ten minutes of terror without a weapon in hand. 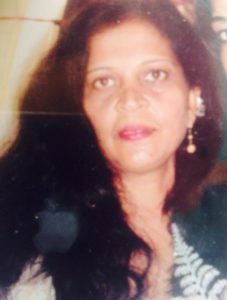 The dead woman has been identified as 45-year-old Leelawattie Mohamed. From reports gathered, Mohamed along with two of her four children were at home when the men barged into their premises. Her two children both in their late teens saw their mother being executed while they watched on helplessly. The woman’s son, Ashad Ishack told Kaieteur News that he was at home with his mother and sister when he heard someone kicking on the front door, he stated that within minutes, three masked men, one armed with a shotgun, barged in and ordered them to lie on the floor. He related that after the men shot his mother they escaped through the same door they had entered, before scaling a fence and firing a shot in the air as they ran towards the backlands. According to the woman’s son, his mother died on the spot after being shot. The police were contacted, and they arrived at the scene approximately ten minutes after the ordeal. Mohamed’s body was whisked away to the hospital. Meanwhile, Divisional Commander Ian Amsterdam during a visit to the home to pay his respects, told reporters that they received a call after 11:00 hrs Tuesday night that there was a robbery. He related that the information received was that while the two teens and mother were in the bedroom, the men held onto Leelawattie Mohamed’s hair and demanded cash. After she denied having any cash in her possession the gun was reportedly placed on her throat “two wounds, one at the throat and on her head, which would suggest that the gun was placed under the throat and when fired the warhead would have exited through the head”. He stated that they were told that the woman then slumped to the ground and the men ran out of the house and discharged a round before exiting the yard. Amsterdam further revealed that one person is in police custody based on information received. The Commander however disclosed that investigators are not viewing it as a robbery but are looking at whether it was a planned execution. He said “given the fact that they shot her alone and before leaving discharged a round, it would seem like it was their intention to kill”.